Dusty Moore’s earned his second UMP Late Model Feature win of the year at Oakshade Raceway on Saturday night, with a last lap pass to get by Rody Schroyer as they came to the checkered flag in one of the most exciting UMP Late Model Features ever. Schroyer started on the pole and took the early lead after battling with Kevin Reeve at the start. Schroyer would go on to lead most of the race, but Dusty Moore and Ronnie Perrine Jr. were lurking further back in the pack on their way to eventually treating the fans to some incredible racing action for the lead. The first caution flag flew on lap six after Devin Shiels spun at the back of the pack. This set up the first look at the new Delaware double-file restart procedure for the UMP Late Model Feature at Oakshade in which the cars lined up two by two behind the race leader. Schroyer brought the field back to the green flag and immediately saw four-wide racing behind him for second. Ronnie Perrine Jr. started ninth and by lap nine, began to pressure Schroyer for the lead repeatedly diving to the inside and getting ahead in the corners, but Schroyer held him off until lap 15. Perrine looked to have completed the pass, just as the caution flag flew again, this time for Chuck Hummer’s spin. That would relegate the lead back to Schroyer for the restart with Perrine second and Dusty Moore third. Those three drivers put on quite a show with some of the most exciting racing imagineable in the final 10 laps of the race. Schroyer, Perrine and Moore continually traded the lead multiple times each lap, often racing three-wide. Schroyer battled back to be the leader on the final lap, but Dusty Moore got an incredible run coming off the high side of turn four to narrowly edge out Schroyer and Perrine at the checkered flag. The Swanton, Ohio driver’s second feature victory moved him up from fourth to second in Oakshade’s UMP Late Model points and Schroyer’s second place finish was enough to move him past an absent Tyler Boggs into the points lead. After the dust settled, Perrine found himself with a third place finish. Casey Noonan was fourth and Kevin Reeve fifth. Steve Mills and Tim Fisher put on a great battle for the lead in the first few laps of the UMP Sportsman Feature. The two drivers started on the front row with Tim Fisher looking for his fourth win already this year. Unfortunately for Fisher, he would end up spinning on lap five to bring out the first caution after dropping back to the third position. Steve Mills led the field back around to the restart and Rusty Smith jumped to his inside. One lap later, Smith took command of the lead. The bad luck continued for UMP Sportsman points leader Tim Fisher when he spun again bringing out the yellow for a second time and ending his night after just seven laps. Bruce Stuart, who won his heat race earlier in the night, moved up and challenged Smith for the lead in the second half of the race, which was slowed multiple times because of cautions for spins. Rusty Smith held off Stuart who couldn’t reel in the leader on the final lap. It was Smith’s first feature win of the year. Brian Fisher posted another top five finish ending up third ahead of Mike Jessen and Brad Mills. Brett Miller from Metamora, Ohio started on the pole of the UMP Bomber A Main and led from flag to flag to earn his first feature victory of the year. Miller initially opened up a big lead until Craig Dippman spun on lap seven bringing out the yellow flag. Dave Sibberson restarted in second and was trying to pressure Miller for the lead and ended up spinning himself which created an incident that also involved Kevin Hanford, Garry Domoe and Rick Dixon. Jim Scout then assumed second behind Miller and after a final one-lap shootout at the end, Miller was able to hold on to be the first to the checkered flag. Scout settled for second followed by last week’s feature winner Chris Henry. Dan Shaffer and Jeff Foks Jr. rounded out the rest of the top five finishers. Ronnie Leonard passed Marty Bloomer for the lead on lap two of the UMP Bomber B Main. Leonard then proceeded to pull away and appeared to be on the way to an easy victory, but Jody Burton had other ideas. Burton closed up right behind Leonard, but could not find away to get around the 16L car driven by Leonard and after some close racing, Leonard held on for the win. Burton was second with Jamie Grochowski third. Roscoe Stetton started last and worked his way up to a respectable fourth place finish with Marty Bloomer slipping back to finish fifth. Aaron Boyd had an impressive run going in the Bomber C Main, taking the initial lead and pulling away a couple times before losing a drive shaft that would end his night in the pits. Brian Barden inherited the lead briefly until Walt Helsel got by one lap later. Helsel stretched his lead over the rest of the field on his way to picking up the UMP Bomber C Main victory. Barden finished second ahead of Jeremiah Floyd, Joe Heffner and Chuck Faller. Oakshade’s UMP Hornet class added another competitor to the swarm of young drivers. Ben Liaeff made his debut in an exciting three-car, five-lap trophy dash. Liaeff joined Tyler Line and Gab Mueller who grabbed the lead early. Line, who is undefeated so far, slipped back at the start behind the other two drivers. Line recovered and in an attempt to take the lead from Mueller, made contact that sent Mueller to the pits. Liaeff took advantage and led for a short time until Line got back around and went on to keep his winning streak alive. 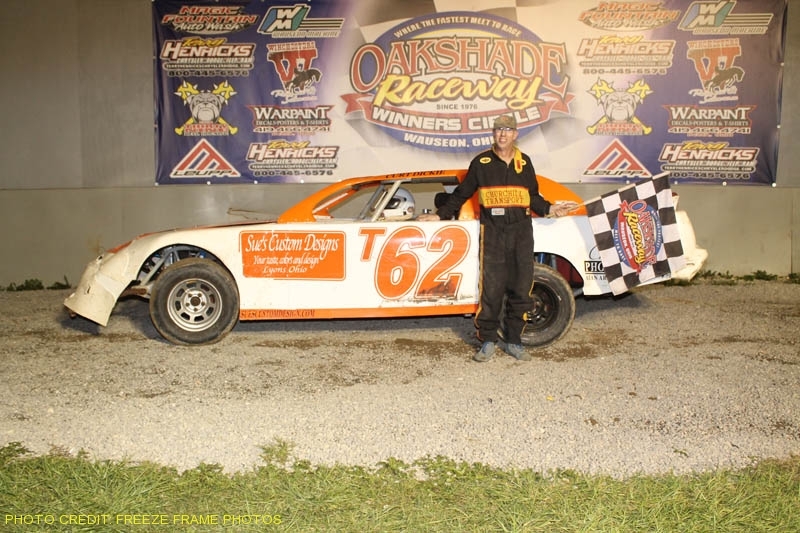 Oakshade Raceway will see the return of open-wheel racing on Saturday, June 7 with the first and only scheduled appearance of the UMP Modifieds joining the regular classes of UMP Late Models, UMP Sportsmen, UMP Bombers and UMP Hornets. Gates open at 4pm with racing at 7pm.